Douglas fir trees rise like massive pillars toward the sky, their deeply furrowed bark and soft needles a backdrop to the landscape I call home. They can live 1,000 years and grow over 300 feet tall. I marvel at their ability to thrive in many landscapes and to endure drastic environmental changes over time. They remind us that we can best adapt to the future when we understand and embrace our roots. 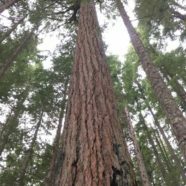 Identifying Douglas fir: Douglas fir is the most common evergreen tree in the Pacific Northwest and Southern British Columbia. It can take the form of a short scraggly bonsai tree shaped by harsh weather or it can grow into a 1,000-year-old giant with a 15-foot thick trunk and a tall crown that surpasses 300 feet. Young bark is grey and smooth with resin blisters, but when it grows over a foot thick, it begins to turn corky, reddish brown and deeply furrowed, making it the “grooviest” tree in the forest. Needles are all the same length, pointed at the tip (but do not hurt you when you brush up against them) and spirally arranged around the branch like a bottlebrush. They smell like grapefruit when crushed. Male cones are small and produce a massive amount of golden pollen that is carried in the wind. Larger female cones are on the same tree, hang down, look woody, and have 3-pronged bracts that resemble the tail and rear feet of a mouse. In a common Salish story, a long time ago, mice were running from a fire and dove into Douglas fir cones to find refuge, where they became eternally stuck. 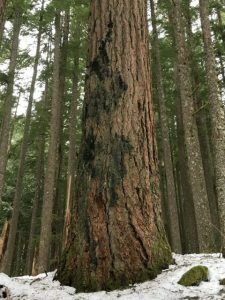 Where it grows: Douglas fir is incredibly adaptable and thrives in many environments including dappled shade and full sun, wet forests and dry open prairies. There are two recognized varieties. Coastal Douglas fir (Tseudotsuga menzesii var. menziesii) grows west of the Sierra, Cascade and British Columbia Coast Range, while T. mensiesii var. glauca (Rocky Mountain or inland Douglas fir) grows in dry alpine areas and the east side of these mountains from Northern Mexico up to Central British Columbia and Alberta. When and how to harvest: Tender new limey-green tips are harvested when they are 1/2 to a couple inches long in April through mid summer depending on elevation. They are easy to pinch off but remember that you are pruning the tree’s new growth. Try taking tips from side branches verses the lead branch and not taking too much from any one part of the tree. Mature needles can be harvested for making medicine during any season. Gather recent windfall or prune branches, then hang them in bundles or dry in baskets. Once dry, run your fingers along the stems to easily remove needles. Doing this in a bucket, deep bowl or paper bag will help contain the needles. You can harvest Douglas fir pitch in any season when is still soft or hardened. Store in a plastic bag or small jar, or wrap in a large leaf such as big leaf maple or thimbleberry. To remove pitch from your hands, use oil or alcohol. 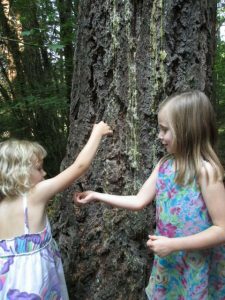 Northwest Native People have eaten Douglas fir and other evergreen tree tips when traveling or during hard physical work to ward off hunger and thirst. The tea could be called the “original thirst quencher.” Many people find that the tea rivaled Gatorade for rehydration and energy. 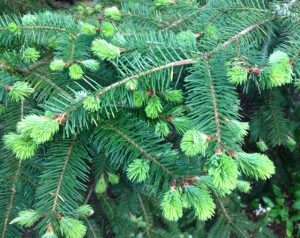 In springtime, Douglas fir tips are tender and have a delicious citrus-pine flavor. Gather them once the papery brown bud sheafs fall off and they are about ½ to 1 ½ inches long. If the bud sheaf is still attached to the base of the tips, you can simply hold the buds in your hand and blow on them to remove them. You can eat a few tips straight or make them into a hot infusion or a sun tea. The hot tea tastes stronger but is less aromatic. 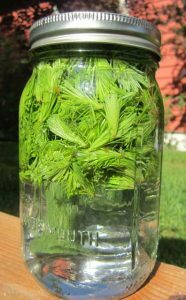 To make a delicious “Nature’s Gatorade,” place the young tips in a jar, cover with cool water, place a lid on the jar and steep the sun or a warm place for several hours to overnight. It tastes great when mixed with lemonade. You can also add the tips to water with lemon, strawberry, cucumber or other fruits to make refreshing flavored water. 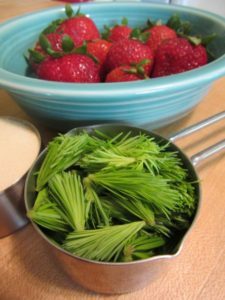 Douglas fir tips are a nice addition to foods like pesto, shortbread cookies or sauces. The tips can be infused in honey or vinegar and used for flavoring liquors, syrups and desserts including ice cream. You can carefully dry them for later use or freeze them in a freezer bag. As the needles get older they develop more tannins, become tough and are less aromatic, but you can still use them for tea. These little snacks are the perfect remedy when you feel depleted. They pack an energy boost and provide vitamin C that promotes immune function. Gelatin is rich in protein and supports gut health. You can cut simple squares or use silicone molds that come in an endless assortment of shapes like stars, flowers, bears and other animals. Place citrus juice, water, beef gelatin and honey into a small saucepan. Heat gently, whisking in the gelatin so it dissolves. When the mixture is hot, but not boiling, remove it from the heat, stir in the tree tips and pour it into a 9 by 9 glass pan or silicone molds. Place in the refrigerator. Once cooled, cut in 1 inch by 1-inch squares or remove from molds. This simple syrup recipe can be used to capture the essence of tree tips including Douglas fir, true fir, hemlock and spruce. I also make syrups from fragrant violet, wild rose and mint. These can be added to drinks or desserts, or of course, drizzled over pancakes. Heat the water in a saucepan over medium heat. Slowly add sugar, bring to a boil, remove from heat and add the tree tips. Allow the syrup to cool before straining. Store in a glass jar in the refrigerator for up to 2 months. To extend the shelf life to a year, add 2 T. of vodka or brandy. Like other evergreen conifers, Douglas fir needles and pitch are high in aromatic resins that fight infection and stimulate immunity. Both fresh young needles and dried older needles are useful for fighting colds and boosting energy. Douglas fir also supports skin health through acting as an antimicrobial, providing vitamin C and acting as a gentle astringent that tightens inflammation. The dried needles make a wonderful smelling bath. Wilted and finely chopped needles can be infused in oil to make a body oil, lotion, or salve. The pitch can be used directly on wounds or added to salve. This oil smells like the forest with a refreshing citrus twist. It makes nice body oil or a base for lip balm, salve and lotion. I often choose olive and jojoba oils as a base because they have the longest shelf life, but if you are turning your oil into a lip balm or salve, you can also use grape seed, almond, hazelnut or sesame oil. Coconut oil will also work if you heat it first so it is liquid. Gather fir young tips when they are about 1-2 inches long. You can also use fully grown needles if you miss the spring growth. Allow the tips to wilt for 1-2 days until they are about half dry. Place the needles in the blender and cover them with oil so the oil is about a quarter to half an inch above the needles. Blend until the tips are finely chopped. Pour into a double boiler and gently heat on a low temperature for 5 minutes, stirring frequently. This will help to remove any remaining water from the oil. For best results, place the oil and tips in a glass jar with a lid and let it steep in a warm place for another week before straining the oil. If you are in a hurry, you can strain the oil immediately. Store strained oil in a glass jar in a cool dark place for up to a year. Douglas fir is hands-down my favorite lip balm, especially in winter when I need a little lift on cold dark days. This makes a great holiday gift and there are many options for lip balm containers including tins, class jars and roll up tubes. This recipe fills about 25 .15-ounce rollup tubes. Gently heat oil and beeswax until the beeswax is completely melted. Remove from heat and place in a glass pouring container like a Pyrex jar. Add essential oil, stir and pour into lip balm tubes. Optional ingredients: 1 teaspoon rosehip seed oil or vitamin E oil. You can also add a little bit of shea butter for healing dry, cracked skin. Native People in the Pacific Northwest used Douglas fir resin for waterproofing canoes, tools and implements. The bark and pieces of the rotten wood (punk) from stumps or fallen trees make excellent fire starter and fuel for cooking. It is ideal for summer fires because it burns hot and clean, yet does not spark and potentially start a damaging fire. Douglas fir wood is strong, hard and resilient. Timber companies often plant it because it is adaptable and it yields the highest amount of timber of all trees in North America. It is used for lumber, plywood, pilings, marine structures, railroad ties, flooring, furniture, pulp and many other things. 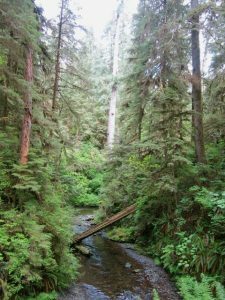 Before Europeans arrived, Douglas fir forests covered 19 million acres from Central British Columbia to Mexico on the east side of the Cascade Mountains. The vast majority of this old growth is gone and less than 5% is protected in national parks and wilderness areas. Douglas fir seeds are packed with nutrients that mice, chipmunks, birds including juncos, pine siskins, song sparrows, golden-throated sparrows, red crossbills and purple finches, and other small creatures eat. Birds help to extend the range of Douglas fir as they migrate. Native Douglas squirrels cash away large amounts of cones in a single location and peel away the scales to get to the seeds. You may see a large pile of scales at the base of their larder. They also eat Douglas fir spring tips and the young inner bark. Douglas fir populations were historically kept in balance by fire. 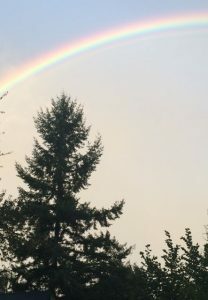 Young saplings will quickly colonize open areas including camas prairies, but Northwest Coastal Native People managed their growth and maintained diverse landscapes through controlled burns, which killed saplings but allowed older trees on the border of the prairie to survive. Older trees can develop bark 9 inches thick and are immune to fast burning fires. You can see burn marks on old trees that survived fires several hundred years ago. Conifers have thrived on our planet for 300 million years. They developed wind pollination far before the evolution of flying insects. While scientists consider this to be a “primitive” form of reproduction, it has served conifers well. There is almost always wind over a forest. They do not have to expend large amounts of energy making showy, fragrant and nectar filled flowers to attract pollinating insects or birds. 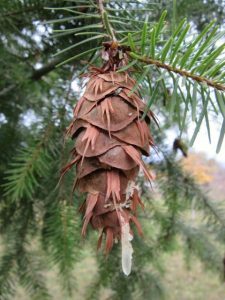 Douglas fir male cones grow in greater profusion on the lower half of the tree so that they are likely to blow to the cones of a different tree, thus promoting genetic diversity and creating trees that are more likely to adapt to environmental changes. The female cones turn upward during pollination and the shape acts like a wind turbines specifically engineered to funnel male pollen toward their ovules. Once fertilized, the seeds mature and develop a wing that helps them to fly a distance from the mother tree. Fallen seeds can remain dormant for years until soil conditions support their growth. Each seed has everything it needs to get a good start on life including an embryonic stem, a root with a protective root cap, a few leaves and enough stored nutrients to carry the tiny plant until it starts photosynthesizing and making its own food. Arno, S. and Hammerly, R. Northwest Trees. 2007. The Moutaineers Books. Randall, Keniston, Bever and Sensen. 1998. Manual of Oregon Trees and Shrubs. Suzuke, D. and Grady, W. Tree – A Life Story. 2004. GreyStone Books. If you really want to get douglas fir sap off of your hands, use penut butter. Ssounds strange but works far better than anything else I ever tried growing up in a fir forest.